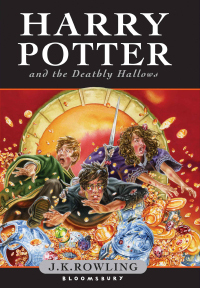 Can’t wait for the seventh and final book in the Harry Potter series of novels, Harry Potter and the Deathly Hallows, written by J. K. Rowling, to be released on July 21, 2007? If you’re one of millions who pre-orders grand finale book of Harry Porter that make the book largest pre-ordered book in history in Amazon, Barnes & Noble and Borders stores, and simply can’t wait out the remaining one month plus to quench your thirst, there are actually fanfiction about Harry Potter written by the fan themselves. There are actually many fan factions or fanfics about the Harry Potter published on the Internet. If you interested in reading any of fan-fic on Harry Potter related series of novel, it’s worth checking out PhoenixSong or Veritaserum (no longer available). Some of the best fan-fics that try to fill the vacuum left while waiting for official final book 7 of Harry Potter are The Seventh Horcrux completed a year ago, and has been compiled and released in many BT torrent sites as fake Harry Potter book 7 ebook. You can download the ebook of The Seventh Horcrux in Microsoft Word .doc (no longer available), Acrobat .pdf format (no longer available), or read online. Another worth reading fan-fiction about Harry Potter and the Deathly Hallows (Book 7) is Harry’s Last Task. Still yet to be completed, it can be read online here (no longer available) or you can download the e-book in Word .doc format here (no longer available).